...and many legends is a something that the Arabian horse breed is surrounded by. 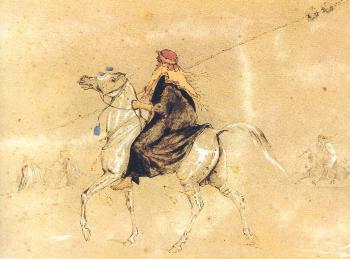 The Bedouins believed in the special powers of the Arabian horse and told many stories around the fireplace at night. The legends were passed on from father to son, as well as the pedigrees of each and every horse were to be remebered by heart. This is the story, as told verbally from generation to generation, about how Mohammed picked out the five mares which was to become the foundation to the Arabian horse. "By the time of this event Mohammed was a very wealthy man and he owned a herd of horses consisting of several hundred animals. From this herd he selected one hundred mares of the highest quality. He kept them in a large enclosure not far from a beautiful little pond. There, beneath the burning desert sun, the mares were to stay without feed or water, for many days. During these days Mohammed spent time with his mares and got to know them. He didn't give them any names but he knew each one of the by the looks. He also taught them a small trick: when he blew a horn, two quick signals, it meant attention and gathering. All the mare were supposed to gather around him. He did this every day so that all of the mares understood what to do when the horn sounded. So one day, when the mares hardly couldn't endure any longer, Mohammed placed himself between the enclosure and the pond. Then he ordered for the gate to the enclosure to be opened. All mares who was still able to move galloped towards the pond, from where they could smell the cold, refreshing scent of water. But when the first mares were almost there Mohammed blew his horn. Then something strange happened! Five mares, consisting of only skin and bones, hesitated and turned to Mohammed and staggered to him. "When Allah were to create the Horse he spoke to the South Wind and said: - I want to create an animal out of you. Make yourself dense. And the South Wind did so and by this dust Allah created a dark chestnut. Allah said: - I call you Horse and make you an Arabian. Then Allah blessed the Horse and gave him the sign of glory and happiness - a white star on his forehead."